On the River Torrens, underneath Red Ochre, is this reasonably fancy restaurant. 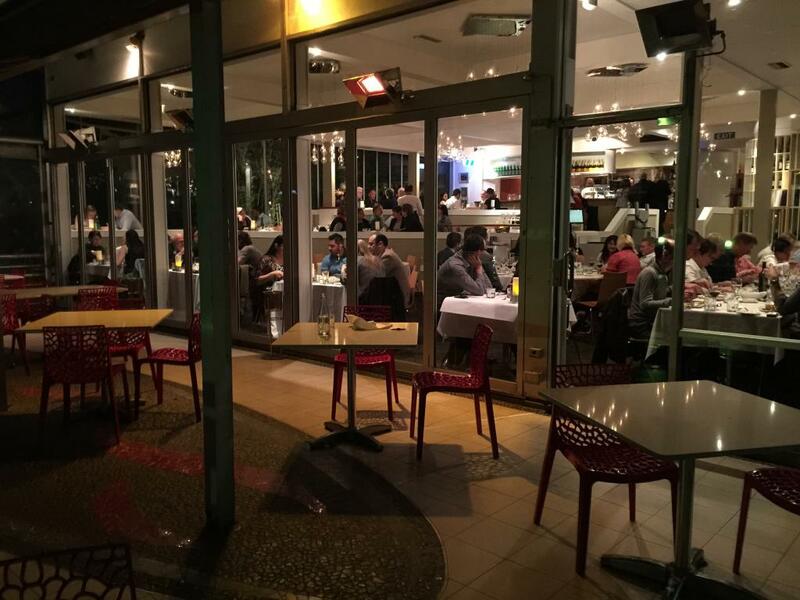 It's full, but I peer through, and spot the unoccupied outdoor tables. Following my own Excellent Tip from last week, I'm wearing an extra-warm jacket, for occasions such as these. 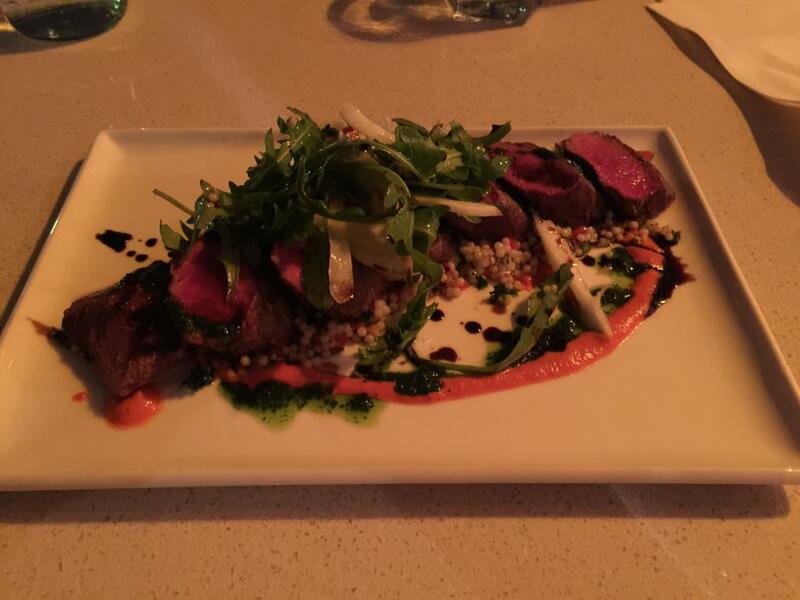 Cooked medium rare, served on romesco sauce with fregola salad, topped with fennel & roquette. The big chunks of meat are very tasty, but pairing them with this kind of giant couscous doesn't work. The couscous isn't absorbent, and it feels like I'm eating two different things at once. The size of the different pieces reinforces this. It's hard to scoop up little rolly balls of couscous with the meat. There is a tiny amount of coriander in here. For all you non-coriander haters out there, imdgibe im chomping on my feed, and occasionally having a lick of a wet bar of soap. Now, you have lived the coriander experience. The waitress commiserates with my hatred of coriander. Vanilla & rhubarb crème brûlée with crostoli. A rhubarb crème brûlée? Now this is worth typing in a whole lot of accented characters for. Ñûm ńüm! There's a layer of rhubarb at the bottom. I scoop up some custard, and a bit of the rhubarb. The first problem appears almost immediately as I touch the surface of the dessert. There's no crispy toffee layer. There's just a slight searing of the surface. 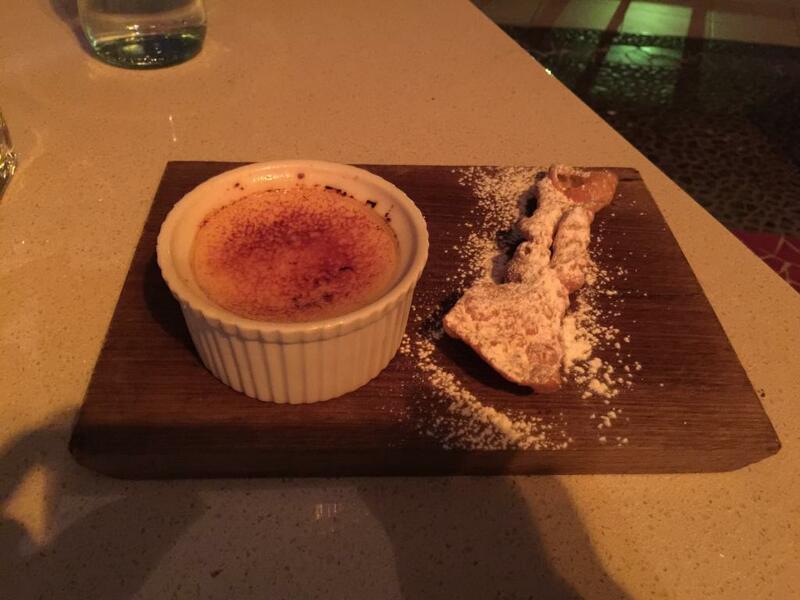 I've never had a crème brûlée without toffee before. Next problem. The custard is slightly warm, while the rhubarb is fridge temperature cold. The custard is mealy, and almost savoury in sweetness. I excavate some of the rhubarb on its own. It has the same lack of sweetness, but is also almost completely devoid of rhubarb flavour. It's got less rhubarb than a McDonald's apple pie has apple. Not sure I will ever have a crème brûlée this bad again. I want to savour the experience. 'Zert refunded. :) Update: I typed too soon. Zert not refunded! Charging a customer for a dessert they were extremely unhappy with, and mostly didn't eat, is terrible business. Many customers wouldn't return.